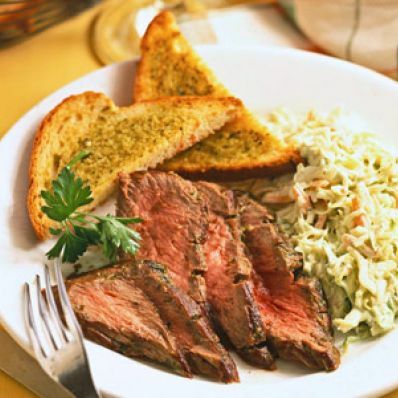 This dinner, complete with steak, potatoes, coleslaw, and toast, is cooked completely on the grill. 1 of 2 Prepare grill or heat broiler. Cut small red skin potatoes in half. Cook in boiling salted water 5 to 7 minutes, until partially cooked; drain. 2 of 2 With knife, score both sides of steaks. Spread 2 tablespoons pesto on each side of both steaks (total 1/2 cup). Grill or broil potatoes until golden, 3 to 5 minutes. Grill or broil steaks 7 minutes each side for medium-rare. slice 1 steak. Serve with croutons and coleslaw (recipes follow). Chill remaining steak and potatoes for next day's Pesto Steak Salad (www.familycircle.com). Makes 6 servings. 1 of 1 Combine softened butter and 2 tablespoons prepared pesto in small bowl. Cut loaf white bread into 12 slices. Spread with butter mixture. Grill or grill, butter-side up, until golden, 3 to 4 minutes. Makes 6 servings. 1 of 1 Combine sour cream, white-wine vinegar, 1/4 cup pesto, salt and pepper in large bowl. Add packaged coleslaw mix; toss. Makes 6 servings.